National Young Audiences Arts for Learning Week (YA Week) 2018 kicked off on March 25, 2018, and will continue through April 7, 2018. 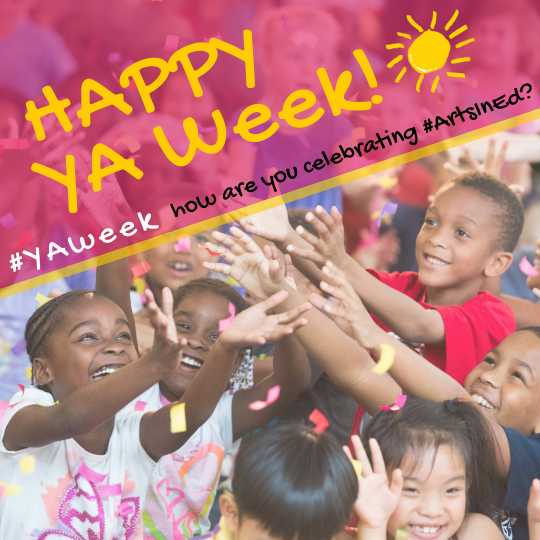 During YA Week, the YA Network raises awareness about the importance of arts-in-education around the country. The annual advocacy and awareness campaign is celebrated by the entire Network of 30 Young Audiences affiliates serving 22 states with arts integrated programming and special events in schools and community venues. Arts for Learning Indiana is celebrating YA Week with a performance of “Peter and the Wolf: Cartoons and Jazz.” The work will be performed in front of an audience of 300 students in kindergarten through the fourth grade. The performance is a jazz adaptation of Prokofiev’s ‘Peter and the Wolf’ using cartoon characters portraying Peter, his friends, and his nemesis, the wolf. The audience will also hear stories from Dr. Seuss and other children’s authors. The Center for Arts-Inspired Learning in Cleveland, OH is celebrating YA Week with a vast array of programming. Highlights include residency programs focused on helping English Language Learner (ELL) students improve their language skills through drumming and literacy arts instruction, as well as a game design residency program focused on digital arts and technology. CAL will also be celebrating YA Week during the spring session of their ArtWorks program, an arts-based job training and college readiness program for Northeast Ohio’s 10th, 11th, and 12th grade students. Arts for Learning Miami will celebrate YA Week with an after-school program at Dr. Henry W. Mack/West Little River K-8 Center. This program provides students with literacy Instruction, reading intervention, homework assistance, healthy snacks, and high-quality visual and performing arts classes including music, dance, visual arts, and theatre. Arts for Learning Connecticut will be sponsoring events in schools across Connecticut during YA Week. In one of their arts-integrated programs, Teaching Visual Artist Claudia Mathison will work with students at Ridge Hill Elementary in Hamden to construct carp kites. On May 5th of each year, brightly colored streamers and carp shaped kites fly all over Japan. During the program, students will use fabric, markers, and ribbon to create their own carp kite while learning about life in present day Japan.